Commercial, manufacturing, and supply aspects in the biopharmaceutical industry can all be managed in order to mitigate risk. This white paper focuses on how a structured and transparent risk management process can be an ideal way to align the needs of patients with drug manufacturers and their suppliers, regulators, investors, and employees. Read on to learn more about guarding commercial interests, building and managing manufacturing capacity, and preventing supply disruption, and how these things can impact managing risk in biomanufacturing. Risks can easily paralyze us with a major impact on patients as the worst result and consequent effects on the company’s reputation and financial performance. As drug shortages are increasingly a matter of public concern, transparency is a key ingredient for successful risk management. It should involve all major stakeholders: patients, regulators, employees, and investors. Many organizations overly focus on managing the small and obvious risks, which often distracts from recognizing the big and dangerous ones. Therefore, we need to accept we can never be free of risks and learn to manage them in an efficient way, proportional to their likely impact. A powerful approach is identifying vulnerabilities in the business and process. By looking at the underlying core of the risk, rather than what triggers it or how to deal with the effects of the risk, we stand a better chance of mitigating it. For example, a natural disaster can prevent a supplier from delivering a raw material. If that raw material is single-sourced, then that is the core of the risk we need to understand and deal with. 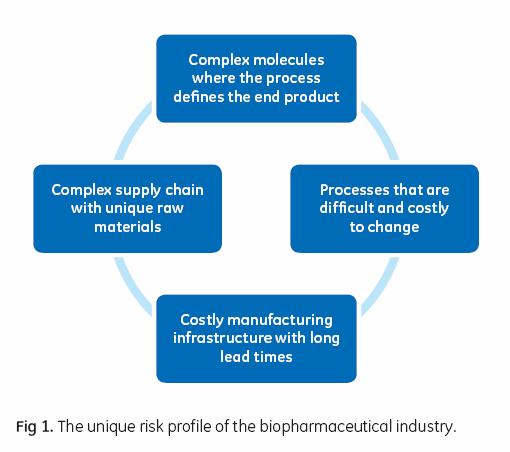 The complexities of the biopharmaceutical industry with its unique risk profile result in distinct challenges (Fig 1). The molecules are complex and once a product and process are approved it is very difficult to change that process. Imagine a risk that can be avoided by exchanging a raw material. What seems like an easy solution in theory can be very difficult in practice, because the change could affect the therapeutic properties of the drug or vaccine. Even small changes in raw materials or processes have been seen to impact drug or vaccine performance and patient safety (1). In addition, the biopharmaceutical supply chain is complex with costly infrastructure and long construction times. Significant investments can be required long before a drug is approved, risking financial loss if the drug fails in clinical trials. Even if the drug is approved, judging the exact size of manufacturing capacity to build can be a significant challenge. Clearly, there are many types of risks in this industry. This white paper will look at different strategies for risk management within commercial, manufacturing, and supply operations. In broad strokes, the first include portfolio and financial risks, the second include how to build and manage capacity, and the latter deals with risks that affects the ability to deliver products to patients. Commercial risks are of course many and varied. Pharmaceutical companies typically choose the therapeutic areas to be active in based on the market potential and competitive dynamics. Decision makers then have at least three major considerations. First, to analyze the portfolio life cycle of existing products. Are patents about to expire, for instance, and what are the opportunities for line-extensions or other approaches to increase a drug’s profitable life? Secondly, to weigh in the financial ambition and answer questions like desired financial return. Thirdly, to consider the overall risk level the business wants to take. This third consideration needs to weigh in the spectrum of risk and reward between different projects. Treating an unmet medical need, such as Alzheimer’s disease, could be highly rewarding. However, such a project also comes at a high risk. Improving existing therapies probably gives more modest returns, but also presents lower risks. These three considerations are challenging in an industry where developing a molecule from idea to product launch can take 10 to 20 years. A lot will change during that time, as history shows us. Twenty years ago, few predicted that biopharmaceuticals would be the success they are today. Several pharmaceutical companies did not foresee this industry shift, even reducing their investment in biopharmaceuticals. Later, they suffered financially from those decisions. Looking back, several factors contributed to this situation. For example, the industry underestimated the value of unmet medical needs that could only be addressed by biopharmaceuticals. Also, the faith in current technology capabilities was too high, driven by a backward-looking market viewpoint that most successful drugs in 1997 were orally-active small molecules. Very few stopped to ask “what if?” and would certainly be surprised today when seven of the top ten drugs are protein based and administered by injection (2). Dealing with the risk of such disruptive changes can be very difficult for companies who have their own established market and technology focus. Given the pace of innovation, many businesses devote more attention to this risk through an external investment strategy by partnering with start-ups or academic institutions. This strategy allows them to explore exciting, but so far commercially unproven areas, like cell and gene therapy, free from their organization’s cultural and technological constraints. Drug discovery is a challenging process where very few projects result in a marketed drug. One strategy crucial for larger companies is having a risk-adjusted portfolio containing low-, medium-, and high-risk projects (Fig 2). This combination would in total generate enough commercial products to meet business goals. An unbalanced portfolio can have serious business consequences if risks are too high and there are no successful products. Or, if too little risk is taken and, although products are launched, they are not sufficiently differentiated to drive commercial success. This approach of a diversified portfolio is possible for large companies, but not suitable for smaller organizations that might need to accept a larger risk so their effort is not diluted. Given the low success rates, large companies tend to have broad project portfolios, especially in the early stages of discovery. Taking “many shots on goal” should statistically result in achieving the goal of commercial drug launch. Unfortunately, such an approach has often resulted in a greater focus on the numbers, rather than the quality of the projects at each stage. Consequently, projects with a very low chance to succeed may be allowed to proceed in order to deliver the expected target outcomes at each stage. The challenge is exacerbated by the fact that different functions might have objectives to deliver certain numbers of molecules at each stage, without shared goals or stringent quality criteria in place. This means projects are moved ahead even though they are likely to fail later. Ideally, the industry should develop a process of continuous learning. That way, common causes of failure could be broadly recognized and eliminated early in the process. To reduce expensive failures, factors traditionally considered in later stages of drug development should be considered more closely in the early phases. Such “front loading” of risk is increasingly helpful in eliminating molecules failing late in the development process for safety reasons (3). How we build and manage manufacturing capacity has great impact on several risk categories. Right-sizing facilities to ensure high utilization is important in order to have predictable volumes and decrease capital risk. Traditional facility construction, however, often starts well before launch when both market size and project outcome are uncertain. This makes capacity forecasting difficult and 25% to 50% errors are common (4). Building too big, too soon puts the business at high capital risk as initial costs are high and depreciation and other fixed costs can be a very large part of a launched drug’s cost of goods (COGS). On the other hand, building too little capacity can result in shortages of a drug, untreated patients, and significant revenue loss. Some businesses sidestep the risk by outsourcing some manufacturing, avoiding big capital risk until there is more certainty of success. Technology advancements are also enabling alternate approaches to risk management for businesses that want to control manufacturing of their product. Three factors are critical: intensifying processes, simplifying construction, and increasing flexibility. Intensifying processes simply means more batches of material can be processed in a particular size of facility. Or, put another way, a smaller, cheaper facility can be constructed to produce the same amount of material. Every extra batch of an antibody can be worth 10s of MUSD at sales price. Making existing facilities produce more can also delay the need for new capital investment of 100s MUSD required to build a new facility, improving business cash flow. All parts of the process can be intensified. For example, it is now possible to significantly reduce cell culture production bioreactor time in a monoclonal antibody (mAb) process. By inoculating at very high cell density this time can decrease from 14 to 8 days (5). The time for performing downstream chromatography steps can also be reduced. Straight-through processing, for instance, eliminates hold steps and can shorten process time by 2 to 3 days (6). However, changes need to be implemented in a holistic way to avoid simply moving the manufacturing bottleneck with no improvement in throughput. A growing adoption of prefabricated facilities is shrinking the time it takes to build a manufacturing plant by up to 18 months. The decision on building the plant can therefore be made later. 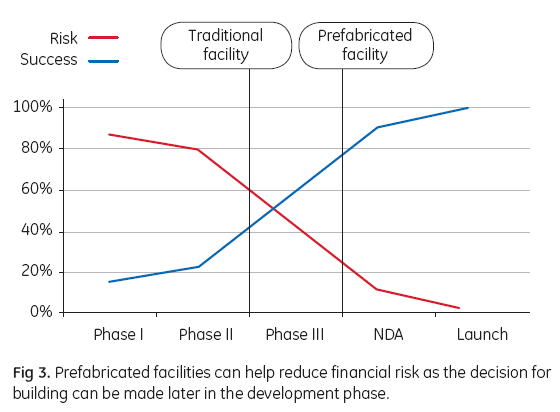 This greatly reduces financial risk as products will have made more progress towards final approval and launch (Fig 3). Single-use technology is often at the heart of many of these facility designs and a key element in driving risk reduction. Inherent in the single-use concept is that some aspects of regulatory risk move from the manufacturer to the technology providers. Single-use technology is also a major driver of flexibility. For example, this technology enables multi-product facilities, which allows capital risks to be spread over multiple products. Other benefits include significantly reduced capital spend due to simpler infrastructure, quicker build times, and reduction of facility downtime and maintenance. A process economy simulation, comparing a mAb process using stainless steel or single-use technology, showed substantial time reductions. In this study, time to market was decreased by 50% or more (7). Single-use technologies combined with the speed of modular construction also offer the possibility to increase capacity by adding smaller production lines as demand grows. Thus, the risk of building too big at the outset decreases. It should be noted, however, that there are instances where a traditional infrastructure is beneficial in terms of overall manufacturing cost. One example is when commercial expectation of a product is very high, requiring perhaps multi-tons of a mAb (8). Supply risks comprise any event that prevents products being delivered to patients. The reasons can be many and diverse: poorly designed processes that are not robust in large-scale production, equipment failure, raw material quality issues or shortages, site malfunction, and so on. When managing supply risk, it is important to focus on weaknesses rather than try to predict what might happen. Identifying where the business is most vulnerable and what measures should be taken to decrease these vulnerabilities is crucial. Drug manufacturers control some of these risks directly. Upfront investment of time to develop reliable processes can minimize disruptions in manufacturing and expensive scrapping of batches. It is also important to assess how to build the safest and most robust manufacturing infrastructure and how much redundancy to create through multi-site manufacturing of the same product. Though a financial drag on a business, multi-billion dollar inventories of raw materials and finished product are increasingly common to manage risk. Raw material suppliers constitute a second major group of risks, largely outside the direct control of the manufacturers. As biopharmaceuticals become increasingly important, there is intense focus on suppliers aligning their approaches to quality and security of supply with drug manufacturers. 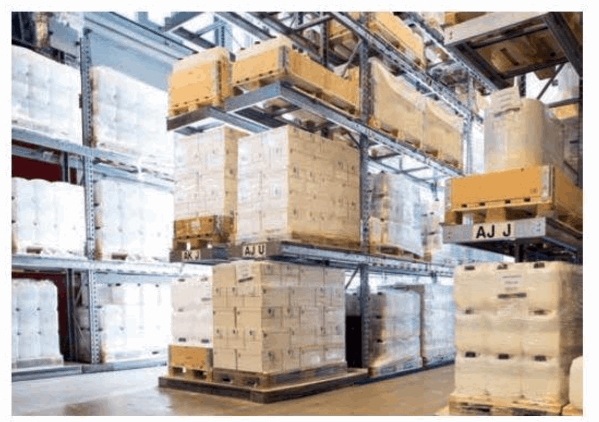 A well-conceived framework should consider key supply chain management (SCM) elements and allow close collaboration between the parties involved. The manufacturer’s risk can decrease when suppliers can effectively assess their risk and implement meaningful strategies tailored to individual materials, products, and manufacturing plants. Today, drug manufacturers increasingly investigate deeper into their supply chain to assess risk. Both immediate (tier 1) suppliers and the suppliers’ supply chain (sub-tiers) are evaluated to assess risk of disruption from shortages of raw materials. Risks can be reduced by choosing tier 1 suppliers that can demonstrate a clear quality system, which supports essential features such as timely change notification programs. Robust product design programs and management of sub-tier supplier quality and capacity are also required. Business continuity planning, how a supplier will manage a disruption of raw material supply or impairment of its own manufacturing capacity, is also regularly evaluated. In such a fast-growing industry, transparent capacity management and a commitment to invest in capacity to assure raw material supply is frequently questioned. Figure 4 illustrates examples of factors used to manage supply chain risk. Both drug manufacturers and their suppliers generate large amounts of data concerning their products and processes. Mining this “big data” becomes easier as the Industrial internet increasingly facilitates connection of diverse data through economical and secure cloud-based storage and analysis solutions. This data is also a source of new insights into managing productivity and risk as shown for other highly regulated and critical industries, like aviation and power (9). In biomanufacturing, benefits are likely improved facility planning and maintenance as well as better understanding of how raw material variations affect process quality and yield. These benefits would lead to increasing productivity and decreasing batch failures or lots placed on hold for quality review. A structured and transparent risk management process is a constructive way to align the vital needs of patients with both drug manufacturers and their suppliers, regulators, investors, and employees. Our industry will never be without risk. Therefore, we should avoid the paralysis that comes with fear of risk and disproportionate management, which ultimately reduces the pace of progress and our opportunity to treat patients. The myriad of risks we face can seem daunting at first sight. The key is to work through the risks in a systematic and cross-functional way involving all levels of the organization. As the process is repeated year after year, the grasp of existing and new risks will improve. Whilst the process is challenging in the early stages, the focus should be on constant improvement in visibility and plans to mitigate risks. This way, organizations become increasingly confident in this essential task and well capable of managing a challenging risk if it does indeed materialize. Yang W. C. et al. Perfusion seed cultures improve biopharmaceutical fed-batch production capacity and product quality. Biotechnol. Prog. 30(3), 616–625 (2014). Case study: Biologic manufacturing capacity expansion with single-use technologies Key variables to consider, GE Healthcare, 29213563 Edition AA (2016). Kelley, B. Industrialization of mAb production technology The bioprocessing industry at a crossroads. mAbs 1(5), 443–452 (2009).